A review copy of Monstrous Uprising was provided for the purposes of this review. The Dungeons & Dragons Fifth Edition campaign The Rise of Tiamat briefly mentions several adventure hooks that DMs can employ that showcase the chaos and unrest from the machinations of the Cult of the Dragon. One of these hooks is a half-red dragon and his band of kobolds and lizardfolk, which the DMs Guild adventure “Monstrous Uprising” expands into a 10-page mini adventure. “Monstrous Uprising: A Sidequest” is a designed as a 4-6 hour adventure for 7th-8th level heroes. It’s stated as a single-session adventure, but my own sessions rarely go over three hours, and there are multiple battles to be found here, including a mini-dungeon crawl. While it’s designed to slot into The Rise of Tiamat, DMs could easily employ these villains in any adventure. Given that the Tyranny of Dragons campaign is nearly four years old, I suspect that will most likely be the case. Unfortunately there are several major issues that hold it back. The adventure begins as the PCs are waylaid by a small group of lizardfolk, led by a Winged Kobold. This is meant to be a fairly trivial encounter for a Tier 2 party (level 5-9). The PCs find a note written from the half-dragon villain, leading them to the lizardfolk camp of Ruined Cliff. For reasons I’m not entirely sure of, the Helmbreaker Mines is listed as our next destination. It’s within a few miles of Ruined Cliff and where the half-dragon currently lairs, but it’s listed in the adventure before Ruined Cliff. I’m still not quite sure how they end up there. The Helmbreaker Mines serve as a small, linear mine-shaft dungeon with some pretty nasty traps. The traps feel artificially enhanced to scale for Tier 2 heroes, including a bear trap that deals 4d10 damage initially, then another 1d10 every round until someone succeeds at a DC 18 STR check. Ouch! The final section involves a series of darkened tunnels with a small table of encounters that require a Survival Check to navigate. I can’t imagine heroes of this level don’t have access to some kind of Light spell, Darkvision, or even a bloody torch. The half-dragon villain does have some nice role-playing notes in case the PCs wish to converse, but otherwise it’s a fairly standard boss room fight. 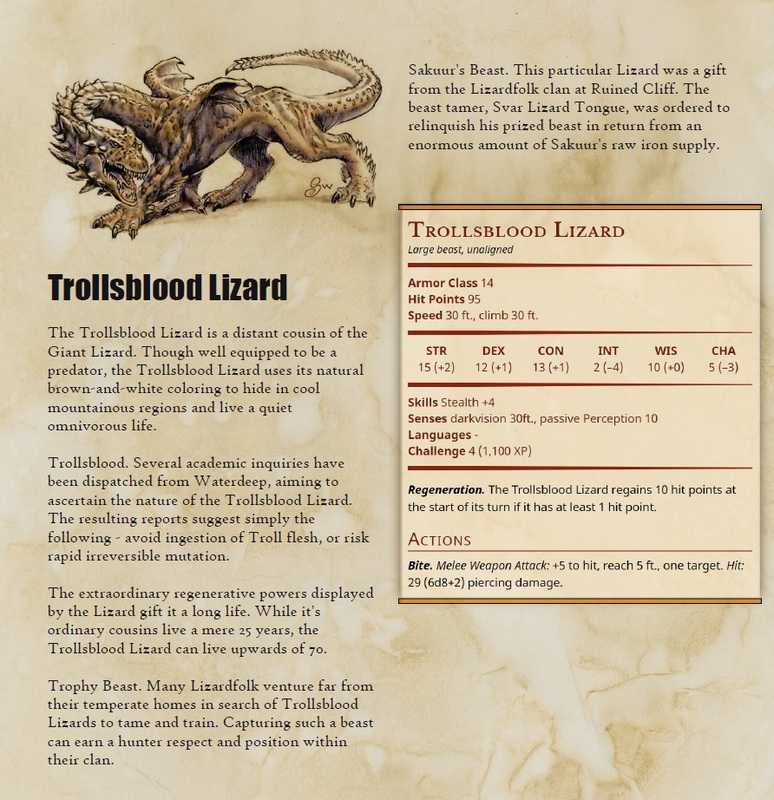 He does have one unique feature, a custom-built pet called a Trollsblood Lizard. It’s a CR 4 beast with Troll regeneration and hugely damaging bite attack. Armed with only one attack and a +5 to hit, much of its challenge is left up to the dice. The Lizardfolk camp of Ruined Cliff is less a dungeon and more of a role-playing opportunity. The PCs have to choose between two warring factions: the camp’s shaman, who’s seemingly looking out for her tribe, and King Akgos, who’s formed an alliance with the half-dragon. The Shaman wants to the PCs to rescue a lizardfolk named Gewjar, but there is no information or details on where he is or what situation he’s in. The King’s task is a bit more straight-forward: stage an attack on Ruined Cliff to undermine the shaman. Attacking the King’s own tribe while purposefully not killing anyone is a really interesting quest, but like the Shaman’s there are no details on how the PCs should go about this, nor what the Camp’s defenses are like, or even their exact numbers. Compounding matters it the complete lack of maps for Ruined Cliff. It feels completely half-baked compared to Helmbreaker Mines, and that dungeon wasn’t very solid to begin with. Ultimately the adventure is confusing and incomplete. I would have preferred sticking solely to one of the two locations and fleshing them out a bit more, with Ruined Cliff particularly needing a lot more work. The three biggest NPC’s all have several bullet points for relevant talking points, and the half-red dragon is given a brief backstory. Specific notes on where and how to reduce the difficulty for Tier 1 PCs. The Trollsblood Lizard is pretty neat. Partial map for Helmbreaker Mines (with no scaling/grid) and no map for Ruined Cliff. Not nearly enough information on how players can deal with Ruined Cliff. Helmbreaker Mines feels like a low-level dungeon that’s been artificially scaled up. 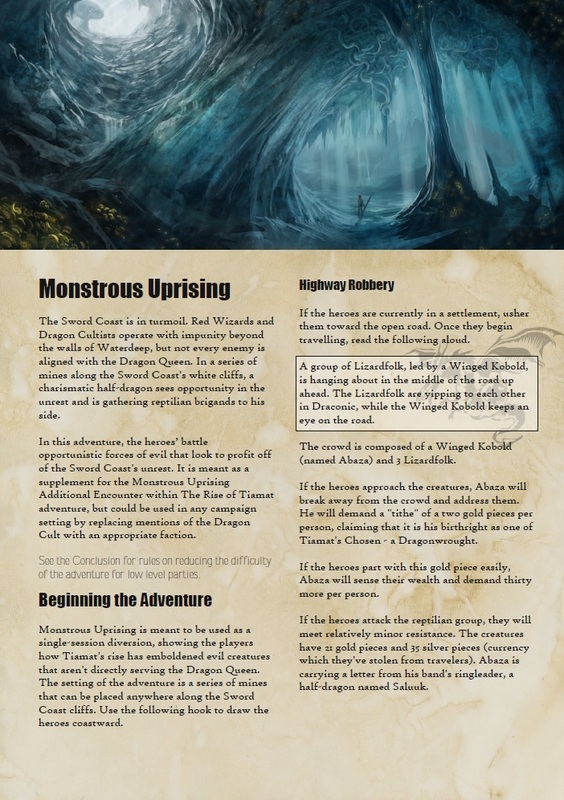 The Verdict: Monstrous Uprising expands on a simple plot hook from Rise of Tiamat, but it feels incomplete, with much of the work left up to the DM. A press copy of Monstrous Uprising was provided for the purposes of this review.